Why Is He Still Texting Me If He’s Not Interested? 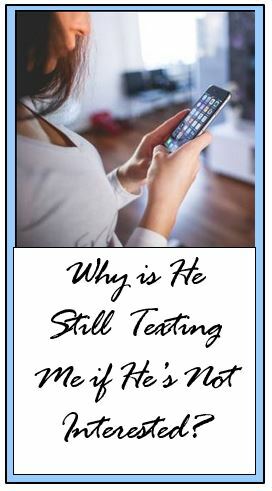 You ask me, “Why is he still texting me if he’s not interested?” So many women suffer as a result of men who continue to text them without spending any time together. Here’s what you need to know to better understand men, texting and what is truly going on. The Bond Feels REAL, But Is It? Single women write to me often, feeling the pain of too much texting and communication without actually going on dates. Sadly, they get attached to the men over time. As weeks turn into months, which happens more frequently than you think, the feelings grow and deepen. This is how a bond forms and where heartbreak comes to visit. It’s easy to see how this can happen. Staying in touch with a man regularly to share bits of your day, cute pics, funny events, etc., allows you to feel close to him. Maybe you start to have pet names for each other, private jokes, or routines that feel comfortable and satisfying. His texts might be sweet, thoughtful, funny or romantic. And when you get a message from him, your heart flutters. He just knows exactly what you want to hear – how is that possible?So you ask yourself, “Why is he still texting me if he’s not Interested?” Your confusion stems from his inability to carve time out for a date and not cancel. Sadly, and I hate to tell you this but, this interaction with him is pure fantasy. Yes, there is a connection, but it is NOT LOVE. It’s the fantasy of love because how can you be in love with a man you never see? You don’t really know him. You only know his texting persona and what he chooses to show of himself VIRTUALLY. The same is true for phone conversations and even video chats. The only way you really get to know someone is by SPENDING TIME TOGETHER. Texting, phone, social media and video are all SUPPLEMENTS for time in person, if you are seeking a genuine, loving relationship. But WHY Is He Still Texting Me If He’s Not Interested? I know the question is still nagging at you. Even if you completely get this is not true love, there’s a part of you that needs to understand what the heck this is all about. Why would a man knowingly continue to text if he’s not interested? It makes no sense. 1.He’s Lonely – Even men get lonely, so having someone to text with makes him feel less alone. Sometimes that might be just enough to satisfy this guy because he doesn’t want or isn’t capable of the full relationship you want. So he continues to text. 2. He’s Bored – He’s not living a rich, full life and perhaps doesn’t get out much. Or maybe he’s socially awkward. Another option is he has a lot of time on his hands. Maybe his job doesn’t occupy his full attention, so texting you is perfect to spice things up! We’ve all been bored from time to time and this is his way of killing time – by WASTING YOURS. 3. He Craves Attention – Some men simply crave attention, especially from an attractive, compassionate woman like you. Someone to listen to his woes or details of his day. When you respond he feels right with the world, knowing someone out there cares about him. Every time you respond, he feels bolstered knowing a great gal like you is paying attention to him. 4. He Needs an Ego Boost – Anyone can feel down or low and what better pick me up then texting with several women throughout the day. Or even just one woman he feels comfortable with. Maybe you boost his ego because you think he’s funny, fun to talk to, creative or really interesting. He may reveal what seems like private details of his life to draw you in closer. Too bad it won’t get deeper than that. 5. He Enjoys it – Texting with you is F-U-N! Are you quick witted or have a good sense of humor? Do you share funny thoughts, pics, jokes or stuff from the media? You have to admit that texting with you is uber entertaining. So he keeps texting to get more, but AT A DISTANCE. If he wanted to enjoy your wit in person, he’d ask you out! But, he’s not asking! There may be more reasons as to, “Why is he texting me if he’s not interested? But, these cover the biggest ones for sure. Here’s the big question for you. Are you ready? It all boils down to this shockingly simple inquiry. What you are looking for in a man? Do you want a texting buddy? Do you just want to entertain men instead of dating them? Are you looking to help men overcome boredom and to fill their time? Do you want to help a man improve his low self-esteem? Are you chatting with men so they can stop feeling so darn lonely? OF COURSE NOT! You want LOVE- the real thing. So, this is what I want you to do. STOP IT. This might seem harsh and you might be thinking, “No Ronnie, tell me I haven’t been wasting my time! Tell me this isn’t true! I know, I hear you but I’m going to stand strong on your behalf and say with great compassion – please stop texting this man. Stop following him on social media. Stop Facetiming, talking to him nightly and hoping at some point that he’ll want to go on a real date to see you live and in person. When it comes to your health and healing the sick, hope is essential. Studies show how important a hopeful, positive attitude is for recovery. But, when you spend months hoping some guy will finally ask you out or see you a second time to get to know you in person – THAT IS A MASSIVE WASTE OF YOUR TIME. This is one place where HOPE becomes a 4-letter word, because you will curse the fact that you foolishly hung in there hoping some guy would finally come through for you. Your best strategy when you get into a situation like this is to GET OUT NOW. Block the guy on your phone and unfriend all his social media. Then go on a super strict diet from this guy and avoid him like the plague he really is. He might not be a bad person – I can say that. After all, he is just getting his needs met. But, he is a complete drain on attracting the love life with right man you’ve been dreaming of for quite some time. If you are serious about finding love, stop asking why is he still texting me if he’s not Interested? Drop that fantasy man and his virtual relationship like a hot potato and free yourself up to find REAL LOVE with a REAL MAN who takes you into his arms and kisses you passionately like there’s no tomorrow. Understanding Men: Why Doesn’t He Say “I’m Not into You”? Hi Sarah, Constant texting doesn’t mean anything. Crazy right? But true. There are many reasons to text that have nothing to do with dating or love. He might be lonely, bored, enjoy texting, likes the idea of having a women who is into him to boost his ego, etc. If you haven’t met him yet and now you think he’s not over his ex – stop texting! You are wasting your time. In general, don’t text longer than 7 days without meeting. Usually that’s a man who is just wasting your time. And that goes for long distance too – most often a waste of time, even though fun and romantic. Hi, About some time back a guy on insta texted me .I haven’t met him ever but he seemed nice .I just talked normally wasn’t really interested But now since its almost 20 days or more I am getting attached.We exchanged no all was well.It looked like he was into me since he always texted first and regularly too.But I just got to know a day back when he told me his ex called and it seems he isn’t over her yet but I acted cool didn’t really show it bothered me. I am confused what to do does constant texting me , calling honey means something or was I being a fool. Hi Alex, I’m sorry you are still hurting over this. You may not want to hear this, but you had a fun, one-night, vacation fling. Nothing wrong with that! Unfortunately, you let yourself move into fantasy with this man. Not all encounters are meant for more. When you wonder what you meant to him, that’s not a realistic question. Don’t let yourself to pine for one date and some messaging. If you want to heal and date to find love, you’ve got to stay in the present and take each date one at a time. Let go of the fantasy. Don’t add your own meaning to a date or a text. The only thing that has true meaning is when a man pursues you consistently over time. That means at least weekly dates, talking on the phone and messages in between. Everything else is fun, but doesn’t mean anything serious is brewing. Please avoid further texting relationships with any man because they do not lead to anything. You might want to also read this post about 17 signs he doesn’t want a relationship. Excellent article, I wish I had been more aware of how this type of “relationship” could affect me. I met a guy on a vacation, went on a date with him, and it was really great. We were from different countries, but we kept in touch over text and social media. Even though the conversations were more flirty than romantic, I still grew to care for him. Of course, after a year! (during which he even said he would come visit but never did) he ended up ignoring me, and I literally ended up talking to myself. The worst part is that I was left with a lot of unanswered questions like did he even like me, what was I to him… I wanted to confront him at the time but it seemed petty and disrespectful. I still struggle with the whole situation, even though it’s been years, and I just wish I could’ve stopped at that one date. Hi Pam, Sounds like he’s lonely on his trip. So her reached out to you knowing you’d be open to communication. It’s only a month if you want to see what happens when he gets back. But don’t get your hopes up. Sounds like his life is up in the air and if you’re willing to go along, he might spend time with you. But he doesn’t seem to be looking for anything serious because that’s not how he’s acting. Or you might decide to date others anyway since you are not committed – why not see who else is out there while he’s away? Hi, I recently went on six PERFECT and really long dates with a guy. It was really like in the movies: perfect setup. After a couple of dates I even met his friends. I’m 22 and he’s 26. Last time I saw him, I asked him if he wanted his hoodie back, he said no, because he wanted to see me again. The next Friday, he texts me that he wants to cuddle soon. On the following Monday, I ask him if he wants to see me again, and he said: “To be a 100% honest, I’m leaving for a month for work and I’m not in the mood to see someone”. He is really busy with work, and during that week he sold his condo and moved to a new one, just a few days before going away for a month. I told him that I was surprised by his answer and wished him a nice business trip. My intention was to not text him back and to move on, even if I was really disappointed (I still think we could be a great match). THING IS, three days after, he texts me, asking about my day. Since then, he has been sending me cute songs and facetimed me almost every day since he left. I am very confused about this situation. Do you think I should see him when he gets back? How should I ask him? Should I move on? I need help! Hi Sophia, If you aren’t sure you even wanted to see him again, why are you hoping for a second date? This is a place for discernment. Why repeat awkward and uncomfortable? To answer your question – yes let the man lead and do not initiate – but especially with a man you didn’t have a good time with. Life is short! Do you want a man in your life that badly to sacrifice quality and enjoyment? I doubt it. Move on and delete him. Please build more confidence in yourself, your worthiness and your ability to attract a good man. Believe that LOVE is possible! Then you can easily weed out the wrong men. Otherwise, you’ll get stuck with a man like this who is awkward and no fun and doesn’t meet your needs just so you can have him in your life. Hello, I recently went on a date with a guy and it wasn’t horrible but it was a kind of stiff and awkward. I know this can be typical with a first date but I walked away feeling pretty sure I would never hear from him again. I also wasn’t really sure whether or not I cared to…I was feeling ambivalent myself. I ended up hearing from him the next day…just a brief hello over text and then a couple more exchanges over the next couple of days. It’s been a week since our date so not a ton of time has passed but he has not made any moves to make more plans or even expressed that he enjoyed my company. I haven’t been very warm and fuzzy, either…could he be feeling out whether I am interested. I feel that I should wait for him to initiate a 2nd date. What do you think? Hi Nan, When a man says he’s confused, that means he doesn’t know what he wants. I don’t know how only you’ve been seeing him or it this is just a texting and long distance relationship. If you actually go on dates with him, then you want to have a real live conversation at least by phone to find out what that means. If he doesn’t want to talk about it that’s probably not a good sign. If this is a virtual relationship, expect that he might become scarce and drift away. Either way, it’s not the best news and he might have chickened out abut changing your status. Hi Marilyn, While I have compassion for your situation, he is RIGHT. Only YOU are keeping yourself locked into a man who offers you nothing but phone calls. Why do you hold onto to his relationship crumbs? He’s manipulative, emotionally abusive and a bully. Who needs that? Block him today – he lives in another state and hasn’t seen you in 2 years! This is similar to addiction and it’s wearing you down. If you want this to change – you have to take the steps. Step #1 block him and unfriend. Step #2 buy the book Women Who Love Too Much This is excellent for helping you get unstuck and let go. Step #3 find a counselor and get the support that will help you make this change. Love yourself enough to start today. I’ve been emotionally and sometimes physically involved with a guy in another state for 7-1/2 years. It was “his” idea to find me; tell me he wanted me back after many years apart (dated briefly years ago). We argue about why he doesn’t make up his mind about “our” relationship. He tells me that if I’m not happy, I’m free to leave, no one is making me stay. After, he’ll call or text to “make up” and tell me all the things I want to hear. 6 months later we get into it again. He has me emotionally strapped and confused. I don’t know how I’m supposed to get away from this. I feel stuck, sad and angry because he said he’d make serious life changes and never did. Why does he contact me every day? I need time away to clear my head, to become stronger mentally, and when I say I need some “me time” he gets angry and pushes my buttons to the point that I give in just to keep things on an even keel. He knows where I live; where I work; so blocking my phone number and social media wouldn’t help. How do I break FREE? I haven’t seen him in 2 years. Hey Samantha, There are many reasons why your ex might have reached out. 1) He missed you, 2) He felt lonely, 3) He was thinking about you, 4) He wanted emotional support, etc. For you, that’s not enough reason to start talking again, so you didn’t want to talk unless maybe he wanted to get back together? Your response was to question what he wanted. He didn’t want to explain himself so he backed off. Hope that helps. Hi there. My ex and I recently broke up after considering that we don’t have any feelings for each other anymore like we used to. This happened about a month or so ago but now he has messaged me, I asked why he was messaging me and he got defensive about it saying I’m happy just talking right now. Why do I have to have a reason? But because I made things awkward as we aren’t talking anymore. I’m confused. Hey Rachel, This man might find you of interest, but he pulled back. Could he be in a relationship because he is sure acting like it – protecting himself and making sure he’s not alone with you. Stop texting him and see what he does. My bet is he’s not going to pursue you further and you need to move on. I met a guy from another office & we hit it off. He’d always rush to my desk, exchange banter, & have a bit in common. I told him to come see me perform & he was stoked to “get to know the real me” & gave me his personal cell (not work cell). I’m mainly the one who texts him. When we see each other at work now, he’s strictly professional, no joking around. His texts have turned into more work-based texts. He does respond within 1-2 hours of my texting. When I joke, he jokes back. (Also to note, my company is in trouble & so is his job if my company fails). He does want to hang out with me, but only if one of my male coworkers is there. He cancelled seeing me perform one time as my male coworker couldn’t make it. I’m confused. Hi Gena, Yes I can see cutting him off would be awkward. What’s most important here is actually your feelings and mindset. Recognize that he’s not serious – intermittent is casual at best. If you want more than casual- he’s not your man. So you can still be friendly, but don’t put your hopes on him. If you want to see him go ahead. But I would date other men. It’s most likley you aren’t his only woman or he’s not that into having a love interest. Your advice is spot on with my situation. But do I cut it off with him if he has made a small effort to actually see me, intermittently. He says he is interested, so I am hopeful. Plus, we have been friends for several years, work together and are also neighbors, so I do not want to eliminate him completely. I don’t just want to cut him off and ignore him, but I don’t know what to say to him either.